What’s the deal with space saver tyres? 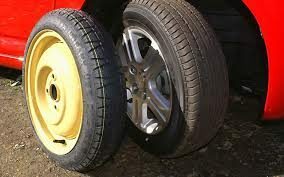 Temporary use spare tyres (TUSTs), more commonly known as space saver tyres, are a common feature in modern cars. Aside from taking up less storage space, one of the ideas behind these odd looking contraptions is that the car owner is reminded to get their flat tyre fixed and the spare returned to the boot, ensuring you’re never caught without a spare. Space saver tyres are more economical for car owners too. Not only do they cost less than a spare wheel or tyre, meaning the overall price of the car is lower, but they are far lighter than a full-sized spare, meaning a reduction in fuel consumption and exhaust emissions because the car has less weight to pull. While they may sound like a great idea based on these advantages, space saver tyres do come with a few rather significant drawbacks. Firstly, they wear out really quickly. In fact, they only have a few hundred kilometres before they need to be replaced. This means they will be sufficient to get you to a mechanic or home if you get a flat around town, but you wouldn’t want to find yourself relying on one in the middle of nowhere. Space saver tyres also aren’t great to drive on. For one thing, you can’t go faster than 80km/h on one, meaning you could be in for a long, slow journey home if you get a flat out of town or on a highway. They also don’t steer or brake as well as a regular tyre, so you need to be extra careful to avoid emergency braking or manoeuvring whilst your car is fitted with one. The other drawback that the creator of these spares mustn’t have thought of is the fact that the storage space for the space-saving tyre in many instances isn’t big enough to hold the punctured tyre, meaning it will be taking up space in the boot or cabin until it’s fixed. When buying a new car, if you get a choice between a full-sized spare or a space saver tyre, be sure to weigh up your options. While the space saver can be convenient and economical, you can also use a full sized spare on rotation, resulting in overall slower wear. Take into consideration how you drive and what you use your car for; if it’s just running around town, a space-saver will be fine, but for longer distances or living out of town, you might be better of sticking with a regular spare. The RACQ recommends only using a space saver in an emergency, and using a full sized tyre where possible.